The purpose of this tutorial is to review the process of enabling SMTP on your PHPFox Neutron website. 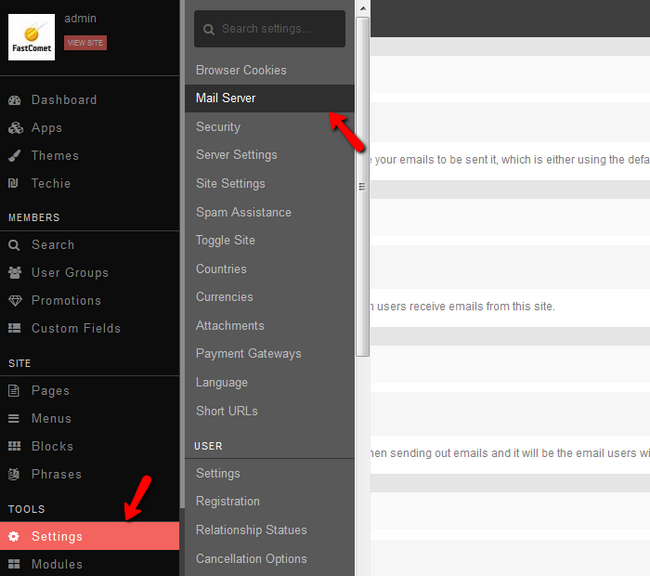 This will ensure the proper sending of system emails out of a certain email account on your hosting package. Our SSD PHPFox Neutron Hosting package allows you to create unlimited email accounts. Have a look at our tutorial on how to manage email accounts in cPanel. Once you have your email account created, you can proceed with the actual configuration of your PHPFox installation. You need to access your website’s admin dashboard and navigate to Settings menu from the main panel and click on the Mail Server section. Send Mail Method: Choose SMTP from the drop-down box. Email: Enter the email account created in the previous chapter. Signature: Choose a signature for the system emails. SMTP Host: mail.example.com (change example.com to your actual domain). SMTP Username: Enter the email account created in the previous chapter. SMTP Password: Enter the password for your email account.